Changing weather conditions can convert what was a delightful day on the water into a real challenge. Forecasting what weather you will encounter is one of the top priorities for safe boating. Should we go out? When should we come in? These are important questions, but some fundamental understanding of the weather can help you make these decisions. That’s what this seminar is all about. While not a course in weather, this seminar explains how just using your own senses can help you determine what conditions you will encounter where you are. By all means, a forecast is important. It will tell you what weather systems are headed your way, but they are challenged to tell exactly where and when conditions will change. Add your own observations and you have an extra edge. Add a couple of instruments and you can verify your observations. The seminar explains weather systems, how to understand clouds and their changes, using changing wind direction, temperature, and pressure to hone in on emerging weather fronts. 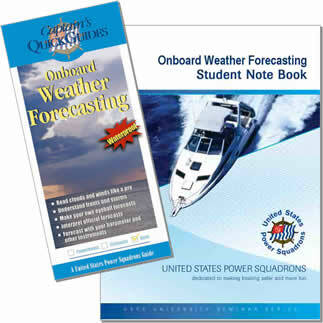 The seminar includes the McGraw-Hill Onboard Weather Forecasting waterproof Captain’s Quick Guide to take aboard your boat. See the trifold brochure (989KB, PDF) for more information.